Social Inclusion Week for County Galway is taking place from the 15th -21st October, 2018. Croí is delighted to be involved with several events throughout the County. On Tuesday, Oct. 16, Croí will be at the Positive Parent Seminar in the Family Centre, Tuam, for free health screenings from 9.30am- 12.30pm. 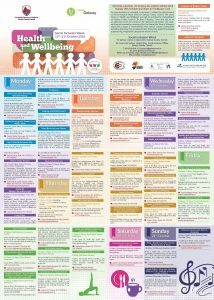 On Wednesday, Oct. 17, Croí will present a Health and Wellbeing Day from 10.30am–12.30pm at Ellis Hall, Letterfrack. The purpose of the week is to increase awareness and understanding of inclusion and diversity in County Galway. It also aims to show how community activities contribute towards Health and Wellbeing. See the full list of events here. Social Inclusion Week for Galway County is organised by Galway County Council.